As relayed in the July 23rd announcement, AS&R is advocating for the new, wider Ohlone Greenway path to be striped for three lanes rather than two. Striping will be for two cycling lanes (one in each direction) and one walking lane. The walking lane will also border a decomposed granite shoulder. This configuration will help those people that are interested know what portion of the path to use in order to stay out of each other’s way. Please sign the petition at http://www.change.org/petitions/city-of-albany-stripe-the-widened-ohlone-greenway-path-with-three-lanes if you support the three-lane configuration. AS&R would also like to collect signatures on paper petitions, such as by standing at the Greenway and asking passersby to sign. If you could volunteer to do this, please contact Zack Mensinger here. At its July meeting, the Traffic and Safety Commission passed a motion for staff to bring back information regarding a three lane configuration, which was great. The next step is to have the Commission recommend the three-lane configuration. All types of users have voiced support of this configuration but we need to show the City that support. The petition will help with that effort. On the Bay Trail, pedestrians are staying in their designated lane despite no bike traffic. 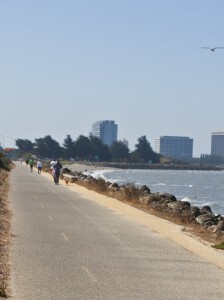 The three lane configuration is seen locally on shared use paths such as the Bay Trail through much of Berkeley, on the newly refinished path leading to Golden Gate Bridge, and on the path along Crissy Field in San Francisco. These paths all have one lane for each direction of bicycle traffic, separated by a dashed line, and a third lane for walkers and runners, separated from the bike lanes by a solid line. All three have markings indicating the purpose of each lane. Data collected recently by Zack on a three-lane portion of the Bay Trail in Berkeley indicated over 90% of path users were in their designated lane as compared to less than two thirds being on the designated path along an old section of the Greenway. 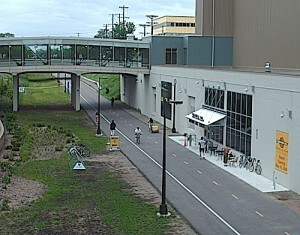 This high level of compliance has also been reported to us on other similar paths, such as the heavily traveled Minneapolis Midtown Greenway. Please help us advocate for safer conditions on the new and improved Ohlone Greenway – thanks! Thanks to the more than 250 Greenway users who signed the electronic or paper petition, our advocacy for this 3-lane configuration was successful! City Staff advised as such and the Traffic & Safety Commission voted unanimously to have one pedestrian lane and two cycling lanes. Thanks to those of you who helped out on this project -we certainly couldn’t have done it without you! !